Takahashi FSQ-106ED @ f/5.0 (530 mm F.L.) Captured at 2.1 arcsec/pixel. Shown at 3.83 and 9.20 arcsec/pixel. SBIG STF-8300M Self Guiding Package w/ mono ST-i, using AstroDon LRGB filters. 1/11/2016 to 2/11/2016 Chino Valley, AZ with CCD Commander & CCDSoft. 525 min. (25 x 7 min. each) "
PixInsight processing includes calibration, registering, stacking, LRGB creation, gradient removal, non-linear stretching with HistogramTransformation and detail enhancement with HDRMultiscaleTransform. The reflection nebula, NGC 1333, is a star forming region located 1,000 light-years from Earth toward the constellation Perseus. 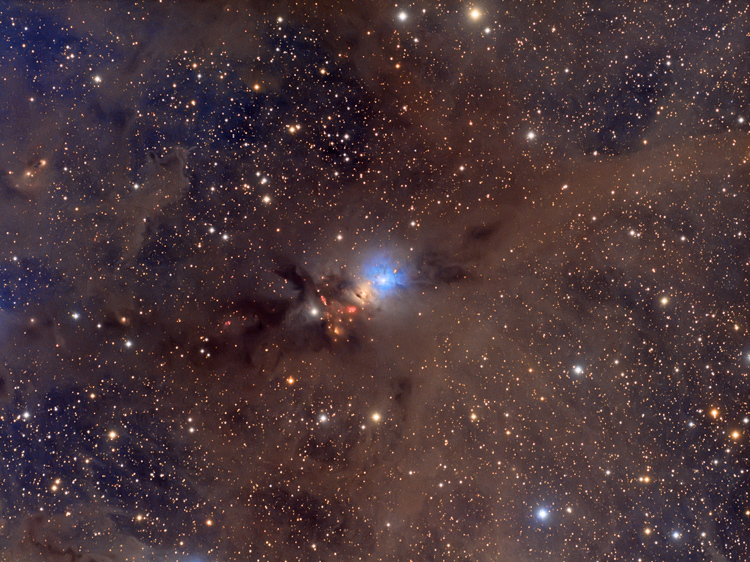 As part of the Perseus molecular cloud, the area contains many interesting objects, including a bright blue and several yellow reflection nebulae. Most interestingly are several Herbig-Haro (HH) objects, located just to the left of the image center. These small patches of nebulosity are associated with newly born stars. The stars form the clouds by injecting narrow jets of gas.